I've been making this Roasted Pumpkin Spinach Salad for years now, and it is still one of my favorite autumn salad recipes. It is easy to make, healthy, and the pumpkin maple dressing is to die for. It is a vegetarian recipe that can easily be made vegan + paleo. This is the salad that's been on repeat here every autumn for years. 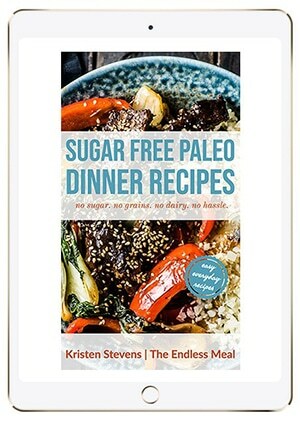 I used to make it for guests at my supper club, and it was always met with rave reviews. Now, I make it for friends and family, and there's never any left in the salad bowl after dinner. 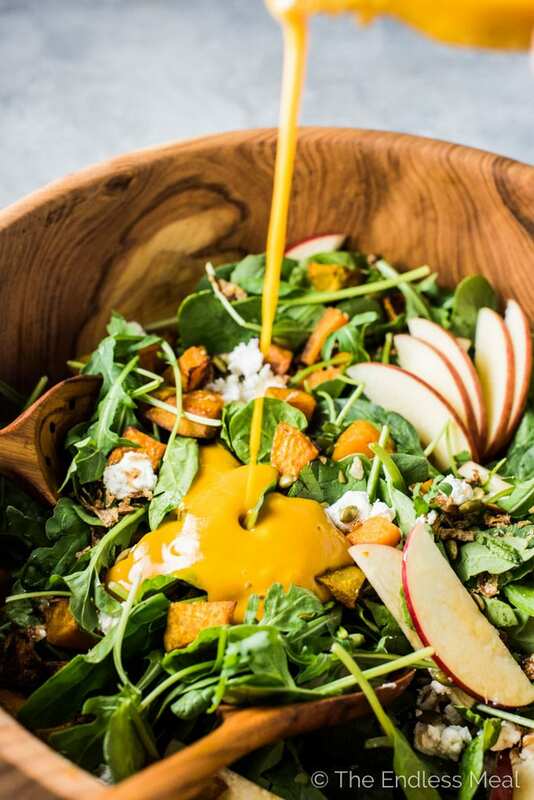 The star of the show here is the maple pumpkin salad dressing. I'm not going to lie, I'm pretty proud of this dressing. I spent lots of time tweaking it, but once I nailed it, I've made it exactly the same way ever since. It's one of the few recipes I follow to a T and never change. The idea for it originally came from a salad I had at a neighborhood restaurant, Railtown Cafe. It blew my mind, and I knew I had to recreate it. It's creamy and gently sweet and has the most gorgeous orange color. Do you see how pretty that orange is? ← insert all the heart eye emojis. 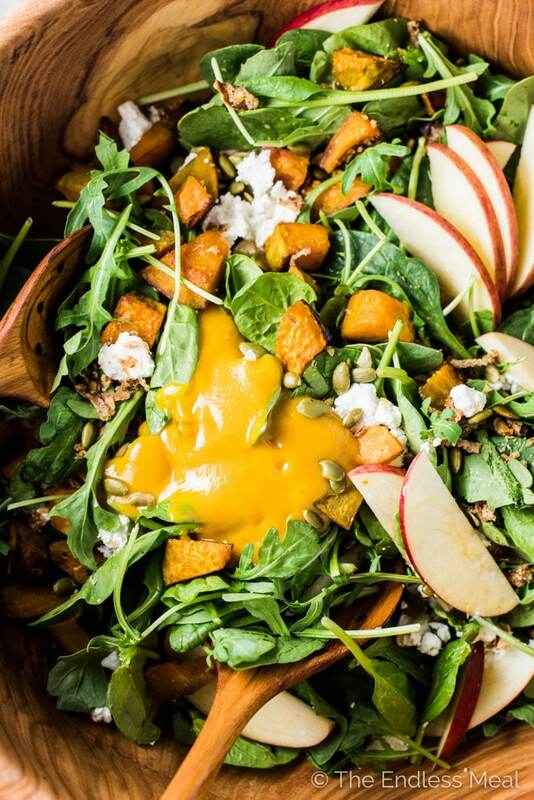 But this pumpkin spinach salad is about more than just the dressing. This is all about flavors and textures that truly compliment each other. Roasted pumpkin → I usually use kabocha squash as I'm totally in love with the rich flavor and creamy texture. You can use butternut squash or even sweet potatoes. They're lightly coated in a sprinkle of cinnamon and cayenne and then oven roasted. These sweet little nuggets are not only delicious and healthy, they really bulk up the salad and make it quite filling. This salad with a piece of fish or chicken on top is all you need for a simple dinner. Goat cheese → There are few things better than tangy goat cheese in a salad. I love the way it breaks apart when you're tossing it so that the whole salad gets lightly coated in creamy goat cheese. It's delicious. 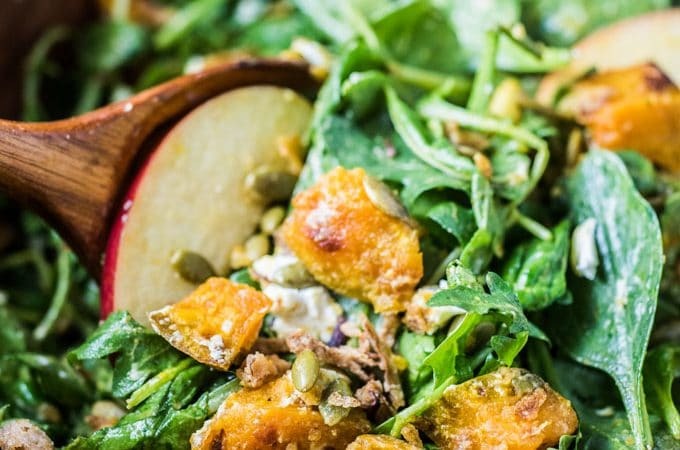 Crunchy apples → A fall salad wouldn't be complete without apples. They add the perfect sweet/tart crispy bite. Pumpkin seeds → Those salty little things that are way more fun to say if you call them pepitas. Set your oven to 420 degrees. Line a baking sheet with parchment paper. Place the butternut squash on the baking sheet, add the olive oil, sea salt, cinnamon, and cayenne and toss to coat. Roast in the oven for 30 minutes, turning halfway, until the squash is soft and starting to brown in some places. 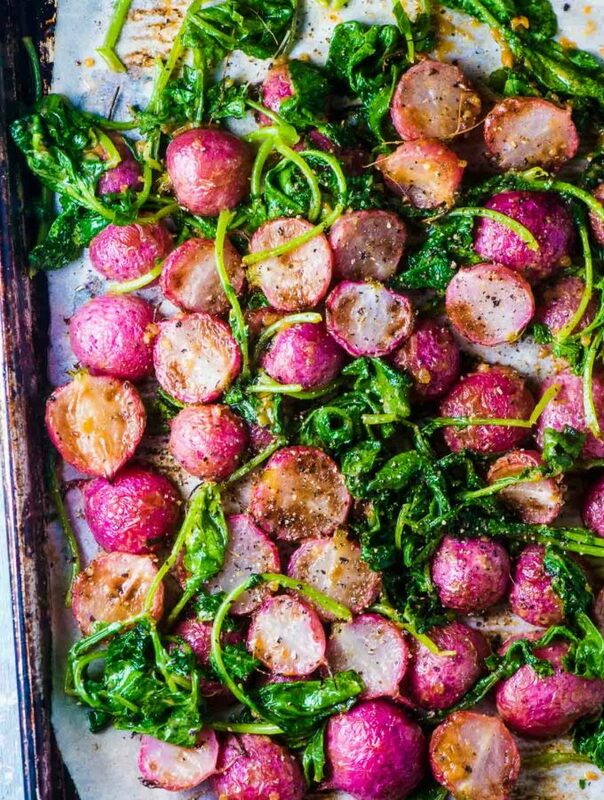 Remove from the oven and let it cool before using it in the salad. TIP: Roast the whole squash and make this salad for a few meals. While the squash is roasting, combine all the dressing ingredients in a blender and blend on high until it is smooth and creamy about 30 seconds. 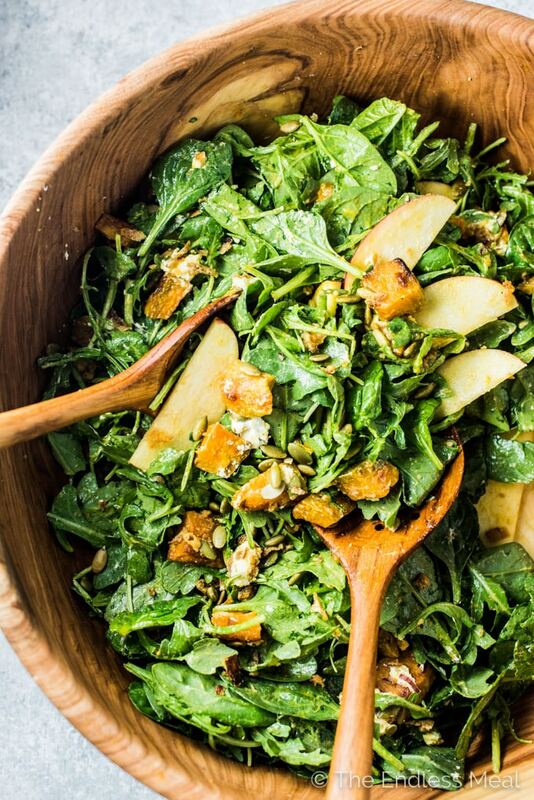 Pile the spinach, goat cheese, pumpkin seeds, fried onions, and apple slices into a salad bowl. Top with the cooled roasted squash and some of the dressing. Toss and serve right away. Do not try and simply whisk the dressing ingredients as the texture doesn't turn out right without using a blender. 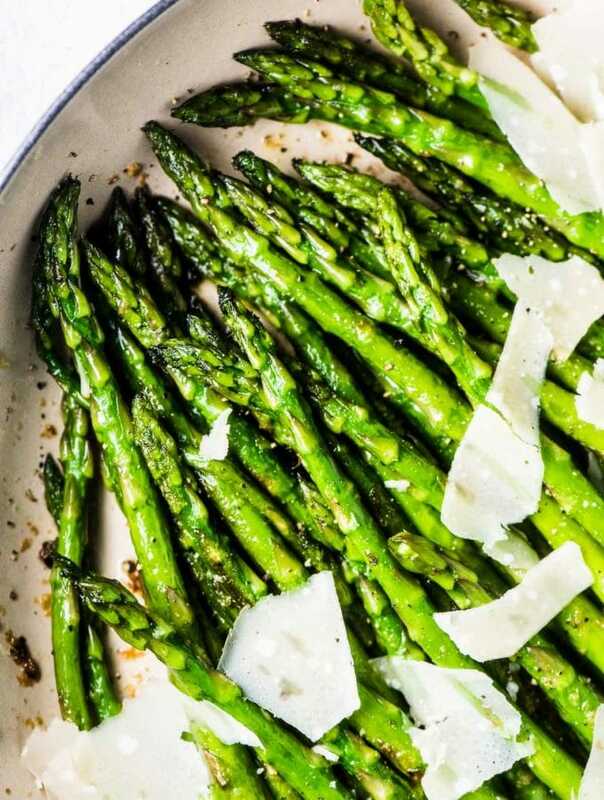 This recipe makes enough salad dressing for three salads. Leftovers will keep in your fridge for at least a week. If you follow a paleo or gluten-free diet, make sure to read the label on the fried onions. Some contain wheat. I love all things pumpkin so this recipe was perfect for me. I used sweet potato because I couldn’t find butternut squash this time of year but will make it again with it in the fall. The dressing is so good too! I’m on team pumpkin year round, too! Very yummy. Mine turned out quite thick, my Vitamix had a tough time blending it through. What size can did you use? I used 3/4 of a 14oz which is about the smallest you can get around here. I’m in LOVE with kabocha squash–it’s one of my favorite fall foods! I hope to find it somewhere around me 😀 this pumpkin salad looks absolutely stunning too! I’m really excited to try cooking with pumpkin more frequently! Isn’t it the best?!! I found out about it a few years ago and now it’s always what I reach for. It’s so much tastier than other squashes!